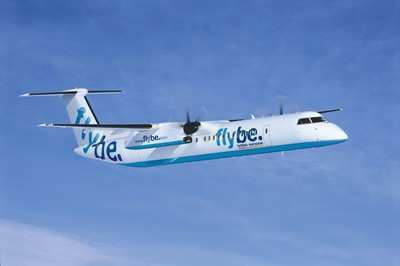 A report released by the U.K. Air Accidents and Incidents Branch (AAIB) says that a autopilot error caused a Bombardier Q400 airplane with 44 people on board to begin a rapid descent shortly after takeoff from Belfast City Airport on January 11. According to the report, after takeoff from Belfast City Airport, shortly after the acceleration altitude and at a height of 1,350 ft, the autopilot was engaged. The aircraft continued to climb but pitched nose-down and then descended rapidly, activating both the “don’t sink’ and “pull up” TAWS (EGPWS) warnings. The commander disconnected the autopilot and recovered the aircraft into the climb from a height of 928 ft.
At a height of about 1,300 ft agl, an EGPWS Mode32 “don’t sink” caution was activated. The commander responded almost immediately, disconnected the autopilot and applied nose-up pitch to arrest the rate of descent, which had reached a maximum of 4,300 ft/min. Engine power was also simultaneously reduced, with the airspeed having increased to 235 KIAS. The aircraft continued to descend for a few more seconds, during which a EGPWS “pull up” warning was triggered. The aircraft then transitioned to a climb, having reached a minimum height of 928 ft agl and a maximum airspeed of 241 KIAS (VMO 3 below 8,000 ft amsl is 245 KIAS); the crew subsequently reported that they had become visual with the ground during the recovery. The aircraft continued to Glasgow where it made an uneventful landing. After landing, the crew briefly discussed the incident, but neither were certain why the aircraft had descended when the autopilot had been initially engaged. The report found that the incorrect autopilot ‘altitude’ mode was active when the autopilot was engaged causing the aircraft to descend toward a target altitude of 0 ft. As a result of this event, the operator has taken several safety actions including revisions to simulator training and amendments to the taxi checklist.